Work faster, smarter and with more certainty. CorelDRAW Graphics Suite 2019 takes the effort out of understanding every project element at a glance, with more control over the management of your objects, layers and pages. Design pixel-perfect documents by auto-aligning objects to your pixel grid, and aligning your pixel grid to your page edge. Enhanced intelligent pixel snapping means more accurate results. Whatever you’re creating, you can be confident with CorelDRAW Graphics Suite 2019. Don’t let your imagination be limited to just your desk. Work anywhere inspiration strikes with CorelDRAW.app, the newest addition to CorelDRAW Graphics Suite. Keep the creativity flowing with non-destructive effects for both bitmap and vector objects, and have peace of mind knowing you won’t lose your original data. Find a variety of new, high-quality templates in a totally revamped New from Template dialog with improved navigation and less clutter. Test the limits of great design with an even more creative CorelDRAW Graphics Suite 2019. Stronger and streamlined, based on enhancements suggested by you! We love getting ideas from our loyal CorelDRAW community, and are proud to include a variety of your suggestions in CorelDRAW Graphics Suite 2019. Take advantage of an interface that’s easier to navigate, along with performance improvements to text, launch time, and more. We’ve also got you covered on functionality with a new way of browsing content, greater ability to customize your app, and updated PDF/X Standards support. Get CorelDRAW Graphics Suite 2019 for less, before purchasing options change. In the near future, Corel will be simplifying its purchasing options. We still believe in offering choice, and you’ll be able to choose between the full perpetual license version and a subscription option. Upgrade pricing will no longer be available to users on older versions of CorelDRAW Graphics Suite, so there’s never been a better time to upgrade. Do it today before these changes take place. Customers on the most current version of CorelDRAW Graphic Suite will always be extended the best offers on new versions as they become available. So what are you waiting for? Turn good & creative ideas into great designs, the moment they arise. 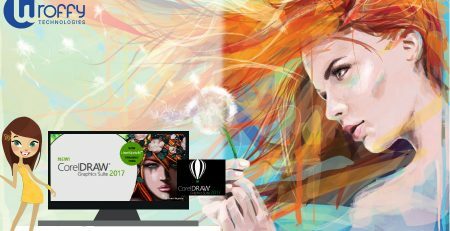 New as part of CorelDRAW Graphics Suite 2019, this powerful web app enables you to access your work whenever and wherever it’s convenient for you. Simply sign into CorelDRAW.app when you want to show a client a concept from a mobile device, or create remotely when you’re not near your computer. At home, or while at work, or on the go, CorelDRAW Graphic Suite 2019 makes doing what you love more accessible than ever. Looking to buy CorelDRAW Graphic Suite 2019 or want to upgrade ? Contact us ! Wroffy is a CorelDRAW Distributor in Gurgaon, Noida & Delhi, India offers Corel Products for business, enterprises and education at best prices.